When Marines pushed into Afghanistan’s Sangin district this summer, it was widely predicted that things would be difficult. The district, in northern Helmand province, had been a notoriously dangerous area for British troops. In four years patrolling Sangin, 106 British troops died, including 36 this year, according to this Daily Mail report. British forces ceded control of Sangin to 3rd Battalion, 7th Marines, out of Twentynine Palms, Calif., last month, concentrating their forces instead in Lashkar Gah, Helmand’s provincial capital — and a place far more stable than Sangin. That’s relevant background when considering the awful news out Sangin within the last week. Nine Marines with 3rd Battalion, 5th Marines, out of Camp Pendleton, Calif., were killed between Wednesday and Saturday, just weeks after deploying to replace 3/7 in Sangin and surrounding areas. Add in an earlier 3/5 casualty in Sangin on Oct. 8, and the battalion already has had 10 casualties in its first month in theater. Four of those Marines were killed last Wednesday when an improvised explosive device rocked their Mine-Resistant Ambush Protected all-terrain vehicle, said Cpl. Zachary Nola, a Marine spokesman at Camp Pendleton. Three other Marines were killed by small-arms fire. That leaves three additional deaths with the same generic cause in Marine casualty announcements: “killed by an IED blast while conducting dismounted combat operations against enemy forces.” In other words, they were hit while on foot, rather than while riding in a vehicle. 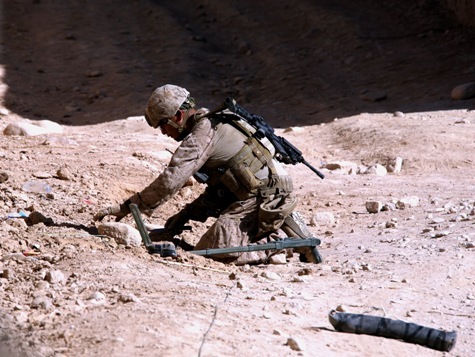 The Taliban’s practice of tailoring IEDs to target Marines on foot is probably more common than what is portrayed in the mainstream media, where the concept of an IED is almost exclusively focused on the targeting of vehicles. In the spring, Marines told me in Helmand’s violent Marjah district that Taliban forces had started to plant directional fragmentation-charge IEDs, a kind of makeshift anti-personnel mine. Typically built in a coffee can or another small, metal device, they are packed with nuts, bolts or spark plugs and attached to 10 to 20 pounds of homemade explosives. They are called “DFCs” by Marines, and they can be detonated remotely or with tripwires. Details out of Sangin have been scarce, but it seems likely they’re facing the same danger. An embedded report posted here notes that Marines are preparing to clear an “IED belt” near Sangin. The military also announced this week that coalition forces recently destroyed an IED “facilitation and storage compound” in Sangin. That means the effort to improve conditions in Sangin is ongoing, but it also suggests the threats there are still very real. You might want to keep 3/5 in your thoughts going forward. *This post was corrected to note that Helmand province’s capital is Lashkar Gah. I was an 0311 with 2/9 in VietNam 1966-67. Afganistan is beginning to resemble VietNam in a number of ways. We had to litterally watch our every step for fear of stepping on Soviet made land mines- The political leadership of VietNam was corrupt, as is the leadership of Afganistan-Our military was severely handicapped by Rules of Engagement, imposed on us by weak kneed liberal leadership in Washington-The enemy enjoyed the advantage of a safe haven across the border in Laos/Cambodia as the Taliban is allowed in Pakistan. Worst of all, we Lost thousands of our troops serving an Administration that played Politics while our troops were being killed and maimed. Well stated Larry, Afghanistan is starting to look like another Vietnam to a lot of the troops out here as well. We often talk about the seriousness of our governments inability to take action on what matters. This is not a war to win “hearts and minds,” as we are nowhere near that stage yet. Once the Marine Corps took offensive action in Iraq, the IED’s significantly reduced as did the casualities involvind marines throughout AO Denver. Until we push troops into the problem areas in Afghanistan, and destroy all opposition, we will never truly be able to focus on winning any popularity contest. I pray that in years to come and countless casualities later, we as a country do not look back on my buddies dying in Afghanistan, as just another Vietnam. I only wish the American people would wake up and fully embrace what is going on over here. It does not affect them directly, however it will affect our entire nation for years to come, if we do not execute and show the taliban we are serious about our cause. One correction: Lashkar Gah is the provincial capital of Helmand, not Now Zad. The British concentrated in Lashkar Gah. Thanks for the comment. Yes, you’re correct, and I’ve updated the entry. Now Zad and Musa Qala are currently patrolled by 1st Battalion, 8th Marines, out of Camp Lejeune, N.C. I am a Marine Mom and I work for a large, International Christian ministry. At the beginning of the week, I placed an urgent prayer request on our prayer altar for 3/5, and we are praying and interceding for them 24/7. God Bless the United States Marine Corps and all Service members. My sons are 0311 Marines 19 and 26 years old. They are trained to fight and not appease. Appeasement is not their job and puts them in Danger. It is frustrating and conducive to making poor judgments when Marines are told to restrain themselves under fire. This is NOT WHAT THEY WERE TRAINED FOR! It gets good men killed. My brother is with 3/5 in Sangin right now. I worry about him everyday. Please pray that the rest of them come home safe and give them them the strength to get their jobs done. God bless the men lost so far this October and my condolences to the families that have lost their loved ones. USMCDAD, I could not have said it better myself. I am in total agreement with you on this. I was absolutely shocked when I learned that our Marines were told to basiclly ask permission before they engage. I said it then and I will say it now, these men where trained by the best with state of the art equipment they trained hard they know there job like the back of the hands and asking them to go against there training and positively Identify these ruthless people while they are firing at them is insane at best. They trained to fight not to run a day care center or set down to a tea party. If someone is firing at you, you can bet the farm they are not our friends. Whoever was the mastermind behind the decision to ID these people should do so and let our Marines fight as they were trained and leave the rest to the idiots who think they know so much easy to say from an overstuffed chair in and Oversized office dont you think? Getting good men killed is not the moto of the Marne Corp.
My scout sniper is in 1/8 in Zad and Musaquala. He has been there a shortime and sustained several injuries minor due to ied blasts. He had to shoot a child, nearly got his eye put out by some debris from a blast, and may have a concusion. He is tough as nails but come on people, wake up, Islam is not a peaceful religion. This is a religious war and they are ignorant and illiterate there. They believe what they are told and it is alla pack of lies. They will fight to die, we fight to live. I don’t see any resolutions here. And, if all the Muslims are not radicals why don’t they stand up and say hey you guys need to cool it you are givin us a bad rap over here in the states. They say nothing because it is their mission to dominate the world so that their savior can return. If we don’t annihilate them on their soil they will be here soon onour soil forcing us by the sword as they have for centuries to deny our God and accept Muhhamad and Sharia law. Wake up people, forget winning the hearts and minds and blast the @#@@@ out of those pathetic cowards. My son is with 3/5. So what is going ON?? If 3/7 only had 3 KIA the whole 7 months, PLEASE 3/7 tell the 3/5 what to do or not to do!! Prayers for the 3/5 Let our men shoot and ask questions later!! The Devil Dogs of Hell are at your door Taliban!! My son is also with the 3/5. We pray for the 3/5 every day and I have started a support group in my community. Have had a lot of positive response from the community to support the troops. Our group will be sending packages over to the 3/5 for the holidays. My understanding is the 3/5 has pulled out of the area the majority of the casualties occurred and they are using A-10’s etc…. rather than sending troops in on foot. I also hope that each one of you has sent condolence cards to the families. I have sent 9 out so far, if you are not sure where to send them then get in contact with the Family Readiness Officer with 3/5 which is on the 3/5 website, they will make sure the condolences get to the families. Each day I check the DOD website so I can send any additional cards if required. My understanding is there was an IED incident over the weekend, was not a casualty but was a serious injury. My son is also with the 3/5 and I’m hearing about all the casualities they’ve taken. I’m praying that they will be protected, not have the same restrictions as last year’s deployment and hopefully the rules of engagement have been changed to allow them to do the job they need to do. Praying for wisdom for our leaders over there as well to know how to direct our men but keep them safe as well. My husband is an EOD Tech with 3/5 and is doing his best to get thru this deployment. I have been trying best to stay off the internet but decided tonight to google and hear what other have to say. I send a special request to all that read this-please pray to keep our men and women safe. I pray everyday for my husband and his team members to be protected and watched-they’ve got a long road ahead of them! We love all you Marines over there and know we think of you everyday. Know your families look forward to your safe return and when you need to smile just think of your family and focus on getting the job done! My husband is over there with 3/5 and I just hope that everyone will keep all these men in women in there prayers so these guys can return safely to there families where they should be! 3/5 I hope you know there are ALOT of people praying for you guys, and that your loved ones miss you very much, and can’t wait for a safe return home! God bless!!! I am a Brit Infantry officer who served in Sangin from October 09 to April 10. It is a tough place but there is hope: there are only a very few ‘spoilers’ who are trying to disrupt what we are trying to achieve with the Afghan government. The majority are fed up with all the violence and the destruction and they want things to improve. Sangin is a bloody dangerous town but I am convinced that the USMC will take the campaign forward from where we left off. I have served with American soldiers and Marines in Iraq, Kosovo and now Afghan (twice) – I know how tough you lot are. My prayers are with those whose men are in Sangin tonight: keep the faith, we will succeed. my son has just joined the marines. i am terrafied. what is really going on in this war? media is unreal i know. what is he about to experience? I was with 3/7 and I think that it’s important for many of you to know that we were only there for about 3 months before 3/5 and took the taliban by surprise, they weren’t used to us at all nor were they prepared to handle US tactics. However even while we were there they were begining to adapt to us. So know that the enemy is always changing always thinking and always watching. They’re not stupid, they know what good tactics are and they employ them well. However when 3/5 took over they did a few things we told them not to do (not discussing it over such an unsecured medium) if they’re still doing what they were when we left them, they need to slow down and take the time to do things right and not try to make a name for themselves. To Robert….I was under the impression that the Marine Corp is a brotherhood – you do not make it sound so. After denigrating 3rd Battalion 5th Marines, of which one of my sons is in, I don’t understand why you bothered to say that you are praying for them. And, I believe that each battalion has a different mission to perform. Obviously, yours was not to do what 3/5 is doing right now. I am proud of what my son is doing, yet I worry about him every moment of the day and prayers are being said all over the world for the guys in 3/5. They knew what they were getting into when they went and if the commander of US and NATO forces can say the following excerpt then I believe 3/5 stands above the rest. This is, however, not a contest as to see what battalion is better, but to see what each battalion can contribute. Maj. Gen. Richard P. Mills, commander of U.S. and NATO forces in southwestern Afghanistan, said that Camp Pendleton’s 3rd Battalion, 5th Marine Regiment drew one of the toughest assignments in Marine Corps history when it was sent in October to Sangin, a strategic crossroads town in Helmand province. “The bravery and the courage of the Marines from the 3rd Battalion, 5th Marines stands with any unit in Marine Corps history, any unit,” Mills said. I think he sums it up rather well. Keep praying for 3/5 everyone – according to my son it is “hell” there. We are a brotherhood, it is complicated to explain to people who were not there how it really is. Especially in a place like sangin. When you work so hard to acheive something, then someone else comes in and says thats not how they want to do it. All the work done for nothing. Thats how it felt, but it is also odd to hear words/quotes from someone that was never there. Who didnt stay in a dirt hole for over 50 days to understand anything anyone there went through. No one said 3/7 was better than 3/5, or the other way around. I do pray for 3/5. And all the U.S military in Afghanistan. probably be back next year to that hell hole. I am a Marine with 3/7. to put things in perspective, 3/7 started off our deployment in a relativley safe area, therefore we had time to integrate with Afghans and get a feel for them. Then after a few months, we started moving away from that area into a more kinetic area(hostile). and finally Sangin. So 3/7 had a better idea of what the area was going to be like and had some combat experience already. At the time, we were not in the news, we were kept out the eyes of the public. we faced a very determined enemy, who like Lcpl Caleb said, is always adapting, always testing and probing trying to find weaknesses. so to anyone in 3/5: slow down, think about what you are doing, ask yourself what the enemy do in this area. look at the small things and youll get the big picture in the area. Stay frosty. I am also a Marine with 3/7. I have nothing but the utmost respect for all Marines throughout the Corps. My brother serves with 1/5 and in fact a good number of Marines I met and worked with with 3/5 knew him very well. To Jada: You really can’t understand the brotherhood that Marines have. Units might bicker, might try to prove who is better, but that is all in the fighting spirit of our Corps and what makes us such a good fighting force. I understand you read the news reports, so it’s easily for you to write quotes. Let me say this; I had the pleasure and the honor of doing some work in the Sangin area when General Mills came through. He spoke to us with a firefight raging in the backround and I quote “3/7 is seeing some of the worst fighting since Fallujah.” Now I know it’s probably not your intentions, but it really seems to me like you are downplaying what 3/7 did and what we shed our blood for to try to pave the way for 3/5. We are all brothers and trying to look out for each other is what we do best. To any 3/5 Marines who have the opportunity to read this; Keep up the outstanding work and know that all of us are praying for you and are standing beside you in this fight. Adapt and overcome to the enemies’ tactics. Anticipate what they will do. Watch the choke points for IEDs, pick out the likely firing points before you move into an ambush and watch each other’s asses! Semper Fidelis and GET SUM! R.I.P Sgt Jason D Peto. Best friend ill ever have. I Love You Bro! Just wanted to say to some of the people saying on here that troops shouldn’t restrain themselves in combat: thats what makes a better soldier. Having served in Sangin immediately prior to the handover to 3/7 and then 3/5 Marines, I can tell you that it is our ability to strike a hammer blow with a needle that seperates us from the mindless beasts that comprise the Taiban. Also, I read on an earlier post that people were calling “them over there” illiterate and ill educated. That may be the case but it does not excuse the wanton use of indirect weapons systems when small arms will suffice. Killing a family to neutralise an insurgent will only create more insurgents.